Previously published in the anthology Under the Kissing Bough. Edmund Sherritt, Major Lord Canforth, has devoted eight tumultuous years to fighting Napoleon. Finally Europe is at peace, and he can retire to his estates and the lovely wife he hasn’t seen since their brief, unhappy honeymoon. The innocent girl he loved from the first moment he saw her, but who shied away from him on their wedding night. The beautiful woman who greets him at Otway Hall on Christmas Eve is no longer the sweet ingénue he remembers. This new and exciting version of his beloved countess is strong, outspoken, and independent, and she’s willing to stand up for what she wants. The question is—does she want the husband who returns to her arms more as a stranger than a spouse? Felicity, Lady Canforth, has had eight long years to regret that she sent her husband from a cold marriage bed to face brutal combat, danger and hardship. The only child of elderly parents, Felicity came to marriage innocent and ignorant, and unable to conceal her shock at the sensual power of the earl’s caresses. Before she found the nerve to offer Canforth a more generous welcome, he was called away to war. The Major left behind a countess who was a bride, not a wife; a woman unsure of her husband’s feelings, and too timid to confess how fervently she desires the man she wed. Fate has granted an older, wiser Felicity a second chance to win her husband’s heart. Now nothing will stop her from claiming victory over the famous war hero. This Christmas, she’ll deploy every ounce of courage, purpose and passion to seize the life and love she’s longed for, ever since Canforth left to serve his country. Whatever it costs, whatever it takes, she’ll lure the dashing Major back into her bed, where she means to show him he’s the only man she wants as her lover—and her love. After years of yearning and separation, will a Christmas miracle heal the wounds of the past and offer the earl and his bride a future bright with love? What a perfect story for any time of the year! What a perfect story! No evil villain and no major drama in this book. Just a young couple who after only being married for 2 weeks are seperated for 8 years because of war. This novella starts with our hero Edmund's return. Felicity is not the young shy bride he left behind and Anna did a wonderful job of bringing our couple together for their HEA! Such a feel good story that will put a smile on your face at any time of the year! I Absolutely loved it! 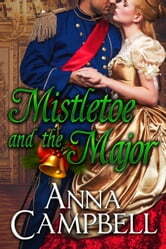 Another Christmas gift to me…because Ms. Campbell does Christmas Regency romances like no other. Edmund, a bone weary, scarred soldier from the Napoleonic War, returns home after being gone for eight years, to a wife he barely knew for a week just before he left for the war. He wasn’t sure she loved him, she was such an innocent when they married. But he knew he loved her and he was afraid his passion would scare her. Now enter Felicity, a capable manager of Edmund’s estate while he was gone and who had always loved him but didn’t know if he loved her. They felt like strangers upon meeting again…but being older and wiser and having been lonely for each other for so long…they boldly got to know each other again with excitement and anticipation. This was a delicious holiday novella!